WhiteCloud Software Ltd. announced the announce the release of version 3.8 of EAComposer. An innovative and simple-to-use enterprise architecture tool used it to manage your IT landscape and technology portfolio. Delivered as a pure SaaS product: cloud hosted with a subscription based license model. The focus on this release was to update the responsiveness of the application. This essentially means that the different feature sections automatically adjust them selves to the resolution of the user device (laptop, tablet, desktop) that is accessing EAComposer. We also were able to include some few new features. All the different list-of-things section (initiatives, templates, compliance assessments, decision log, views, portfolio, reference & standards library) have been updated to be fully responsive and with improved filtering and sorting capabilities. For all the other sections, the non list-of-things sections, we also improved the responsive behaviour, aiming to avoid scrollbars and dynamically resize the content based on screen resolution of the user device. We enhanced overall real-estate usage by moving the left-hand menu into a popup menu style. We reduced usage of popups, and will continue to further reduce popups usage. We added a new "heatmap" feature inside the visual modeler. You can create a predefined color-scheme for a component based on extended property values. You can then drag this heatmap onto any diagram which will update the component colors based on their extended property value. This means you can turn any diagram into a heatmap instantly by simply dragging the heatmap onto the canvas. We improved the realtime notification updates when you or another user are saving or updating content within EAComposer. You will see a little notifier popup to give you the result of any save or upload action you have performed as well as anything another user has performed on the same content. This will be further expanding later this year when we do more improvements on the collaboration feature. We have a very powerful framework in place that will enable us to create a really strong capability here. Our next release will be focused on improving the overall performance of the platform by making some infrastructure changes. There will be no change to your data residency. Customers in the Asia and North America regions will see the most improvements but also our customers in Europe will benefit. 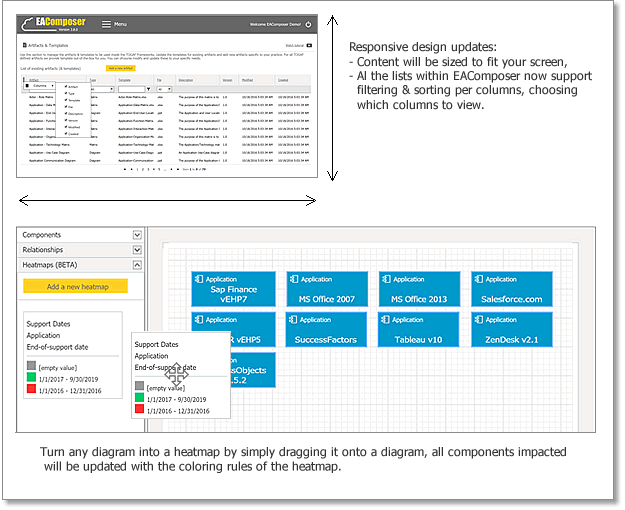 We aim to make EAComposer as quick, snappy and responsive as possible.